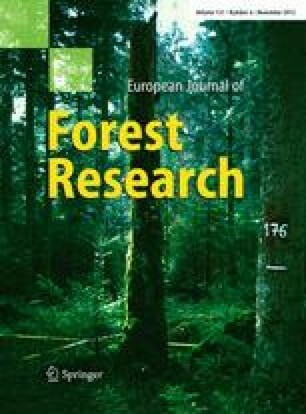 Physiological reactions of 25-year-old Norway spruce (Picea abies (L.) Karst.) trees to drought were examined during 2009 vegetation period. During the second half of summer, the decrease in soil water content was observed and irrigation was applied to a group of spruce trees, while the second group was treated under natural soil drought. The response to water deficit was recorded at the level of leaf water potential (ΨL). However, it appears that ΨL plays minor role in early stomata regulation of Norway spruce as CO2 assimilation rate (P N) and stomatal conductance (g S) were reduced already before water potential decrease. Leaf water potential decreased significantly only in case when soil water content was low in the long run and when transpiration losses were simultaneously relatively high. Almost complete stomatal closure even of the irrigated trees was caused by the increase in the vapour pressure deficit of the air (D) above the value of approximately 1.5 kPa. Low values of D were accompanied by partial stomata opening of drought-treated trees. In non-irrigated spruce trees, the values of P N decreased by 35–55% in comparison with irrigated trees. No drought-induced significant changes were found either in chlorophyll and carotenoid concentration (chl a + b, car) or in maximal photochemical efficiency of photosystem II (F v/F m). High rates of sap flow (F) did not always lead to stomatal closure during midday. It appears that high transpiration rates do not control stomatal response to D.
This article originates from the international symposium “Managed Forests in Future Landscapes. Implications for Water and Carbon Cycles (COST action FP 0601 FORMAN)”. This publication is the result of the project implementation Extension of the Centre of Excellence “Adaptive Forest Ecosystems”, ITMS: 26220120049, supported by the Research & Development Operational Programme funded by the ERDF. This work was also supported by the Slovak Research and Development Agency under the contract No. APVV-0022-07.